Generous Alumnus Tony George has issued a $500 Challenge Match to DOUBLE the first $500 in gifts made to Track & Field/Cross Country on June 1st, WWU Give Day! Because our program chooses to invest in competitive opportunities for as many athletes as possible, we do not have the funding to issue team gear to the nearly 100 people that make up our team. They have thus been left to purchase any WWU T-shirts or training attire on their own, meaning that some athletes have gear while others do not have anything. We believe that being a part of a program is meaningful and each member of this team deserves to proudly represent it. Will you help us show our Viking pride? As a coaching staff, we believe that we are blessed to work with very responsible people, and we thank you for that. But still, even responsible people tend to break things… although our demonstrated resourcefulness in building our own implements or repairing broken equipment using parts from other broken equipment has kept us afloat for a long time, we believe that high caliber athletes deserve high quality equipment… or at least functional equipment. This includes the hurdles that are used by everyone on the team to starting blocks to rakes and shovels to throwing implements to foam rollers. Basically things that we use on a daily basis that allow your athletes to get better and keep them healthy. Perhaps you remember a coach who taught you to discipline your mind and body...to demand excellence from yourself...who said "I believe in you" - even when you didn't believe in yourself. Perhaps you had a coach who taught you that courage doesn't always roar; sometimes it's the quiet voice at the end of the day that says "I will try again tomorrow." They say a Coach will impact more young people in a year than the average person does in a life-time. Did you know that more than half our coaches are here as volunteers? While we provide stipends where we can, we still believe that people deserve to receive what they earn. If you believe your Coaches had an impact on your life, perhaps you'll see why we are asking for your help in providing our Student and Volunteer Coaches with what they have already worked so hard for. Each year we look forward to three major competitions as a team. Our Indoor Conference Championship in Nampa, ID, the Mt SAC Relays in California and our Outdoor Conference Championship in Monmouth, OR. These trips are almost entirely funded by donations from people such as yourselves. Plane tickets, Buses, Hotel Rooms for nearly 70 athletes! It all adds up. And folks such as you have always been there. For that we are incredibly thankful and hope that you continue to support our Student-Athletes! Without your help, hardworking people may have to stay home. Also, the climate of the way our Cross Country teams qualify for the NCAA Championships has changed. The selection committee now expects the best teams to travel across the country to battle each other head-to-head in order to make it to the National Championships. While this will make our competitions more exciting, it will increase the need for funding to travel and compete against Universities in the central portion of the country further stressing our already tight budget. As a coaching staff, our goal is to have each and every athlete that comes through our program look back on their time here with great fondness. Their experience is shaped by the people they meet, the life lessons they learn and what they experience. You directly impact that experience through your financial generosity. Any gift that is received is sincerely appreciated! 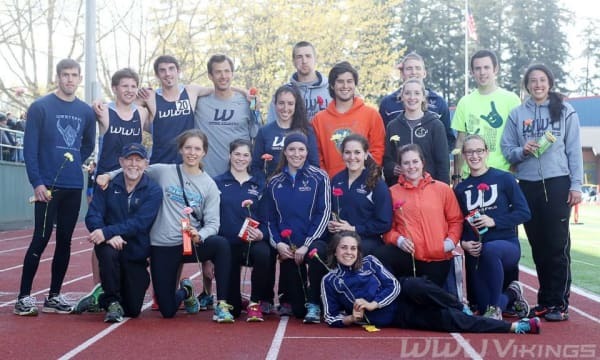 Thank you so much for being a part of YOUR WWU Viking Track & Field program! Funding to issue team gear to the nearly 100 people that make up our team. Currently athletes must purchase their own gear. We believe that being a part of a program is meaningful and each member of the team deserves to proudly represent it. Will you help us show our Viking pride? This will go toward equipment that includes the hurdles that are used by everyone on the team to starting blocks to rakes and shovels to throwing implements to foam rollers. Basically, things that we use on a daily basis that allow our athletes to get better and keep them healthy. Your gift helps to supplement stipends for the many volunteers that help Western cross country and track & field programs be successful. These are great people that deserve to be compensated for all they give to our student-athletes. Plane tickets, buses, hotel rooms for nearly 70 athletes! It all adds up. And donors like you have always been there. For that we are incredibly thankful and hope that you continue to support our student athletes! Without your help, hardworking student-athletes stay home.